FAQ: How long do implants last? FAQ: When should an implantation take place? FAQ: How many implants are required? FAQ: Do I need an implant for every missing tooth? FAQ: Is the operation painful? FAQ: How long does the operation take? FAQ: How will I feel after the implantation? FAQ: What discomforts could I experience after the implantation? FAQ: How many examination check-ups are required after an implantation has been carried out? FAQ: What are the risks? FAQ: Can elderly people also benefit from implants? FAQ: Can implants also be used in the case of children and teenagers? FAQ: Can implants be used in places where there is not enough bone substance? FAQ: Do the implants need special care? FAQ: Are the costs for the implants covered by health insurance? FAQ: Will implants improve my quality of life? FAQ: When is bone augmentation necessary? FAQ: Are multiple operations necessary? FAQ: Can I chew everything with implants? FAQ: Can I have implants if I am suffering from osteoporosis? FAQ: Can I have implants if I have diabetes or after radiation treatment/chemotherapy? FAQ: How long do I have to wait after the implant placement before the prostheses can be fixed? FAQ: When can immediate implantation be carried out? FAQ: When can an immediate loading of the implants take place? FAQ: What is the point of having temporary implants? FAQ: What is the best implantation system or the best implant type? FAQ: Can implants cause any adverse side effects? FAQ: What costs have to be taken into consideration when having implants? FAQ: How much does it cost to anchor dental implants? FAQ: How much are implant-supported crowns? FAQ: How much are implant-supported removable dentures? FAQ: What are the treatment costs in case of bone augmentation? FAQ: Is there an age limit for dental implants? FAQ: Is it possible to get temporary prostheses during the healing period? FAQ: Is it painful to have dental implants inserted? Implants are permanent – like your own teeth they can last for decades. Apart from the general condition of the patient, oral hygiene plays an important role as do the quality and quantity of the jaw bone. An implantation should be carried out as soon as possible. If medically viable, implants should be placed 6-8 weeks at the latest after the extraction of a tooth. The later a tooth is replaced by an implant, the more the bone will have receded. Later bone augmentation is complex and expensive. This is especially true of teeth with only one root. After losing teeth of the types 6 and 7 (molars or grinders) it is usually better to wait about six months till the bone tissue has reformed in the root area. Like natural roots, implants should pass on the load resulting from intense chewing to the jaw bone. The more missing teeth can be replaced with implants, the better it is for chewing and the bone structure. This would definitely be the wrong place to save expenses. According to a statement issued by the German Society for Oral and Maxillofacial Medicine (DGZMK), at least four implants per jaw are recommended for a complete removable prosthesis. For fixed dentures at least six implants are recommended in the lower jaw and eight in the upper jaw. No. Bridges, for example, can also be fixed onto implants. The required number of implants depends on whether they should support fixed or removable dentures. No, the operation is not painful. Most patients do not even require any pain killers directly after the operation or the following days. Most patients reports that they felt much better after the operation than they had expected. It only takes a few minutes to place an implant. Additional measures, however, such as corrections of the hard and soft tissue, are more time-consuming if the need should arise. Most patients report that they were not in pain after the operation. If you should feel any pain, you can normally treat this easily with tablets. Swelling and sometimes also bruising may occur. These usually wear off after the third day. During the healing period examination check-ups are recommended at the following intervals in order to detect possible complications in time and prevent them immediately: after 1-3 days, after 5-8 days, after 2-3 weeks and then at intervals of 4 to 8 weeks. As with every other operation wound healing disorders and infections may occur. Severe complications, however, are very unusual provided the operation was performed by an experienced surgeon. If an implant should get lost (extremely rare), it can usually be replaced by a new one. Yes. There is no age limit for implants. The successful outcome of the operation does not depend on age, but on the general condition of a person. If you are healthy enough to have your teeth extracted, then you are probably healthy enough for implants. If implants are anchored in the jaw prior to the natural completion of a patient's growth and loaded with dentures, local disorders of bone growth are likely to occur. That is why implants are a viable option only for girls older than 16 and boys older than 18. If at all, dental implants should only be used for orthodontic purposes. The jaw bone does not always have enough volume to support a stable implant. 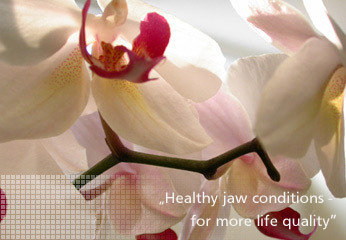 Possible reasons for this deficiency can be a loss of teeth, bone loss or an insufficient height of the jaw. In such cases the bone has to be artificially augmented. Treatment alternatives are bone splitting, bone spreading, and bone augmentation with the body's own bone substance, with cultivated bone and / or bone replacement material. Implants have to be regularly taken care of and checked in the same way your own teeth need attention. Perfect oral hygiene is the most important prerequisite for a long-term success. Especially the contact areas between implant and gum have to be kept free of deposits. As is the case with your own teeth, special cleaning techniques are required (dental floss, special brushes for cleaning between the tooth and gum line). Regular, professional dental hygiene is also a must. Private insurances usually pay the majority of the implant costs. Public health insurances only refund such costs in special cases such as increased jaw shrinkage, after severe accidents, in the case of cancer of the jaw or a congenital cleft jaw. Dental implants give you a natural feeling as if you were chewing with your own teeth again. The appearance, feel, and function of implant-based prostheses (crowns, bridges, dentures) can be compared to those of your own teeth. You can eat and drink everything without having to worry about your dentures! Therefore your quality of life, well-being, and self-confidence will greatly improve. To guarantee a long-term success with implants, the jaw bone should be at least 5 mm wide and 10 mm high. In case of a heavy bone loss, the jaw bone has to be augmented to meet a minimum height and width prior to implantation. This is usually done a few months prior to the planned placement of the implants. When treated by an experienced surgeon, immediate implantation accompanied by simultaneous bone augmentation is frequently also possible. Modern treatment methods allow for very careful and gentle procedures. A transplantation of the iliac crest bone is rarely required. A preliminary operation may be required in the case of substantial bone defects. If this is not the case and the implants are not placed under the mucous membrane to facilitate the healing process, then only one operation is needed. With implants placed under the mucous membrane, the implants have to be exposed prior to the fixture of prostheses. Yes. Implants can be used in exactly the same way as normal, healthy teeth. Yes, but the healing time for the implants has to be extended. Otherwise, there is no reason not to go ahead with the treatment according to the current state of knowledge. Yes, but great care has to be taken. In order to minimise the risk of wound healing disorders, medication for diabetes should be carefully adjusted prior to the operation. This depends largely on the position of the implant and the bone quality. This usually means 2-3 months for the lower jaw and 4-6 months for the upper jaw. The general condition of the patient also plays a part. With younger patients, the bone usually heals quicker than that of older patients or patients suffering from diabetes or osteoporosis. Experienced surgeons can attain remarkable results with this method. Bone loss, which is feared by many patients, and the loss of papillae can usually be prevented. This method is only viable if the patient has no acute local inflammations or extensive bone defects. The patient should have good oral hygiene and observe the recommendations of the dental therapist. Immediate loading of the implants has proved to be very successful for many years. This method is especially feasible if the implants can be anchored into the bone with a high degree of initial stability. Further preconditions are a minimum amount of implants and usually the blocking of implants. With temporary implants (transitional implants or immediate implants) removable temporary prostheses are fixed securely during the healing period of the definitive implants. These immediate implants are a way to improve the comfort of the patient during the healing time of the definitive implants. As soon as the permanent implants have acquired enough stability, the transitional implants are removed. In theory a good dental therapist is able to treat almost all patients with just one system of implants. However, experience has shown that patients can clearly benefit – especially regarding the long-term stability of their implants – if their dental therapist is familiar with different systems. Keeping the advantages and disadvantages of the various systems and makes in mind, he can then choose the most suitable implant system for a patient's individual medical requirements, the particular anatomical situation and specific treatment objectives. Apart from differences in quality the various implant types can also be distinguished according to surface structure, geometry, technical requirements, prostheses fixation etc. Intolerance to dental implants made of medical titanium is extremely rare and hardly the cause of complications. Alternatively, zirconium implants can be used in case of known general hypersensitivity or intolerance to titanium. Adverse side effects of zirconium implants have not been recorded. When providing dental implants we differentiate between treatment costs for the implantation and the costs for producing temporary and final prostheses (crowns, bridges, dentures). Various specific factors which can only be determined with the help of a panorama x-ray (showing the quality and quantity of the hard and soft tissue etc.) and discussed during a consultation have to be taken into consideration when having implantation treatments. We also offer our patients various implant types and treatment concepts. Together with our patients we plan the best individual treatment depending on medical requirements and the requests / wishes of the patient. If no bone augmentation or other additional measures (e.g. surgical manipulation of the mucous membrane) are required, then the overall price (including costs for materials and the surgeon's fee) is between EUR 900 and 1400 per implant (depending on the selected implant system, treatment concept, and treatment objective). An implant-supported crown costs between EUR 900 and EUR 1300 depending on the material used. Implant-supported dentures cost between approx. EUR 3900 - EUR 4500 for four implants and between EUR 4900 and EUR 5900 for six implants - depending on the material used. Here expenses vary greatly depending on the individual case. Different treatment methods have to be taken into consideration and the evaluation of the soft tissue is also extremely important. The costs for bone augmentation can therefore only be determined after a detailed consultation and examination. Implants can be placed as soon as a person has finished growing. There is no upward age limit as long as you are in good general health. A temporary solution is possible for people who have gaps between their teeth or missing teeth. The implants are usually anchored under local anaesthesia. Even in difficult cases and independent of the necessity of bone augmentation the operation is never painful.